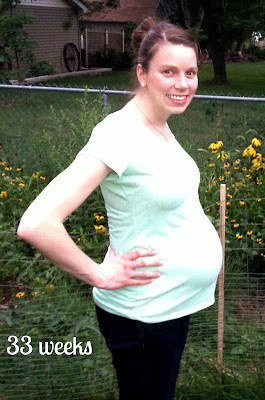 Maternity clothes: wearing them? Yes. Next on my list is to buy a dress for my 2nd baby shower. Food cravings? Nothing really this week other than ice cream, but it is summer and that isn’t really all that different than any other summer. Anything making you queasy or sick? Nothing new here. Sleep: Well, I haven’t slept through the night in over a week. I have to get up at least once to go to the bathroom or for no reason at all. Nursery: The hubs had to work again this weekend, so the room is not yet done. He’s working on it this week though, so hopefully it will be finished up before shower #2! Currently, we have lots and lots of things in our living room. Pepper is very confused as to what all this stuff is and where it came from. She keeps hiding her tennis ball in the different baskets, wanting a reason to find it later. Movement? Similar to last week, Baby is moving quite often. I love feeling the movements even if they make me uncomfortable or surprised. It really is quite amazing. Weird pregnancy thing of the week: The latest super fun pregnancy thing has been the night sweats. Sorry if this is TMI for some of you, but for the past week, every night I’ve been woken up in the middle of the night in a pool of sweat. My head and chest are fine, but from the belly down to my toes, I’m drenched. It has given me some panic attacks, worried that my water broke, but that is not the case. Workouts this week: Lots of walking and that is about it. This answer probably won’t change until after Baby is born! Looking forward to: The hubs finishing up the nursery this week! The plastic is down and the window-wells are taped! Things are finally progressing. Thanks! Oh I've heard that the night sweats don't stop after the baby is born either. Should be fun!! It is hard to believe the baby will be here in just a few weeks! Ahh!! How exciting that the nursery is almost finished! That probably makes everything feel even more real! Yes! I'm so excited! It is starting to feel much more real with each passing day! Ugh! Night sweats! And every night! I hope that doesn't last much longer. I get those sometimes and it feels so gross to wake up that way. Even scarier to think your water broke! Thanks. This week the night sweats seem to have come and gone. Last night I woke up with a hot flash. It is really gross to wake up, and its like, what do I do? Change the sheets in the middle of the night? Change my clothes? Gross. I know!! So crazy! I was just reading the labor and delivery part of my baby book yesterday and this whole thing is becoming much more real! Ahh! !